Combining an area light with four portable lanterns in a single clever unit, the LED Quad lantern is a versatile choice for indoor or outdoor use. The Quad is equipped with four removable LED panels that hold 24 LED lights total. Users can remove any of the four panels and use them independently, such as when needing a portable light for the bathroom or tent, or they can keep all four attached to the lantern and produce 190 total lumens of light. As a result, the Quad is the perfect light for group camping trips and any other occasion where folks might splinter off into smaller groups during the night. Each of the panels is a fully functioning light, with six 5mm white LEDs, a rechargeable NiMH battery, an independent on/off switch, and a top handle for carrying or hanging. The NiMH battery--which recharges when stored in the lantern base--provides up to 1.5 hours of light on its own. The lantern base, meanwhile, requires eight D-cell batteries (not included), which provide an approximate run time of 75 hours for the entire lantern. 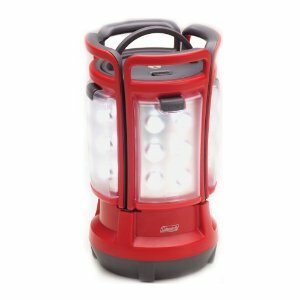 Other features include a main on/off switch located on top of the lantern, a light range of 26 feet, and a limited five-year warranty.